One could, if one were so inclined, imagine that a collective of despondent monks finding common ground in its unified love of Joy Division might make an album like Namesake, the third full-length from Canadian art rock trio Ten Kens. With a string of arpeggiated bass notes and an ethereally obscured chant, Death in the Family slowly introduces the album; an eventual fit of heightened percussion and six-string volume act as somewhat of a prelude to the rest of Ten Kens’ expanded opus, itself devoted to the rise and fall of sound and the ultimate final act this approach to songwriting cultivates. 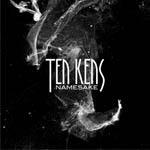 Produced and written by Ten Kens’ Brett Paulin and Dan Workman, Namesake had originally been released in 2012 as a digital-only album, ten songs in length, and now exists as an expanded physical edition. In the same way that Liars’ 2010 release, Sisterworld, built a very dark and foreboding narrative, (a narrative expressed through the experimentally charged and eccentric vision of its authors), Ten Kens follow with fourteen songs that propagate varying degrees of tension (Gently Used), rough-edged melancholia (The Calm of the Car) and blistering energy (German Purity), all of which are consuming and replete with an emotional core that ties the album together. Through expansive arrays of musical tooling and the realization of sounds both nervously pensive and beautifully abstract, Paulin and Workman’s efforts make the most out of vocally shaping many of Namesake’s passages, ghostly forms often leading to a heavy payoff. While Death in the Family’s approach is more subtle and patient, the eerie Fetal Misgivings and built up Mousetrap both demonstrate this deployment of volume, the effect generating a sonic payoff of sorts. Otherwise, the album finds resonance through the rhythmic float of Bliss to the alt-rock riffs spilling into The Field Around Your Van, from the expressive noise of When A Door Opens to the percussive onslaught of the album’s title track. The additional four songs, Take Me To Your Leader, Above The Ego, Little League Now and Whatever Man, sound at odds with the original ten, add-ons that don’t necessarily fit into Namesake as it had initially existed. As an album that had already sounded complete, the inclusion of extras leads Namesake in a different direction, in some ways diminishing the extended outro of the album’s true closer. An EP may have been the way to go, but this is a small criticism for an album that is an otherwise very cohesive and well-conceived work, its expansive resonance and mood altering shifts in tone resultant in something both haunting and sublime.